Who doesn’t love a classic pasta salad? It transends cuisine and culture, being a quintissential part of American summers, but just as important at Pakistani weddings, right alongside the raita and biryani. The mayo based dressing allows a variety of ingredients to come together and taste delicious, and is always welcome at any dinner table. 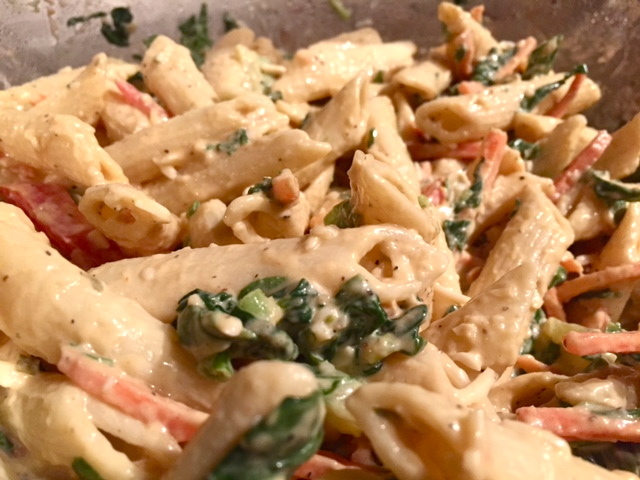 Add some arugula and spinach and you’ll elevate it from a backyard BBQ classic, or keep it just as you like, because i’ve never met someone who doesn’t enjoy a pasta salad drenched with flavor. Ingredients of course, are not set in stone. Vegetables and pasta shapes are dependant on pantry availability in my house! Mix the pasta with the vegetables and set aside. In a small bowl mix the thousand island dressing, BBQ sauce, mustard, mayo and seasoning. Pour over the pasta and toss until combined. Chill before serving. This is something that can be made in advance, but the longer it sits, the more dressing the ingredienst will absorb. If you’re making it a day ahead of time either mix the dressing right before serving, or add a splash of cream or 1 Tblspn of mayo to revive the dressing.